I'm using the wall to try to finish the backing for Halloween Hexagons...and I don't think it's going to work. 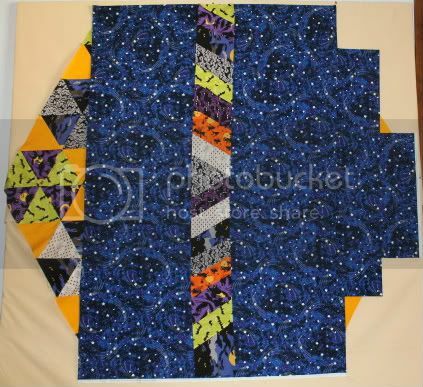 I only had six fat quarters of the stars, and adding that pieced section will only give me another 5" strip, which won't cover the left side. So I don't know what to do. The fat quarters are (of course) from last year. And they glow-in-the-dark - anything I piece from my stash won't. I could scrap it and go buy some minkee or flannel, because honestly, the spiderweb I plan on quilting won't show as well on this back. Not a very effective use of stash...but then, neither is this right now. I do think the strip is kinda cool, though. Check out more interesting design walls at Patchwork Times! How about using muslin for the backing and the back piece for a couple rug mugs or centerpiece? Halloween Hexagons - Top Finished! Tennessee Waltz Top - Finished!